A trip to remember, and a refreshing welcome home. Refreshingly juicy bite with a nice zing. Recently, the hubs and I went on a last minute getaway, and explored a part of the country neither one of us knows too well: The American Southwest. We had two concrete places on our itinerary, and decided that we would take the leisurely and scenic routes, stopping if anything catches our eye. 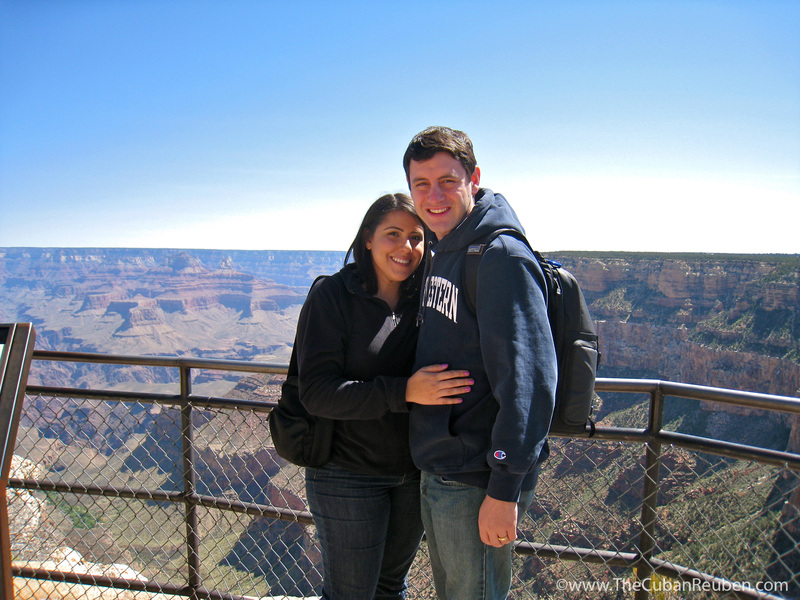 The first stop on the itinerary was The Grand Canyon National Park. Kenny had been to the Grand Canyon previously with his dad, and swore to return with me in tow. Far be it from me to deny him this pleasure, but the truth is the pleasure was all mine. We hit the ground running at the wee hours of the morning. After a brief jaunt in Barstow, CA (to caffeinate) and Laughlin, NV (to refuel. read: eat lunch), we arrived at our first destination just in time to watch the sunset. The Grand Canyon and Kenny. 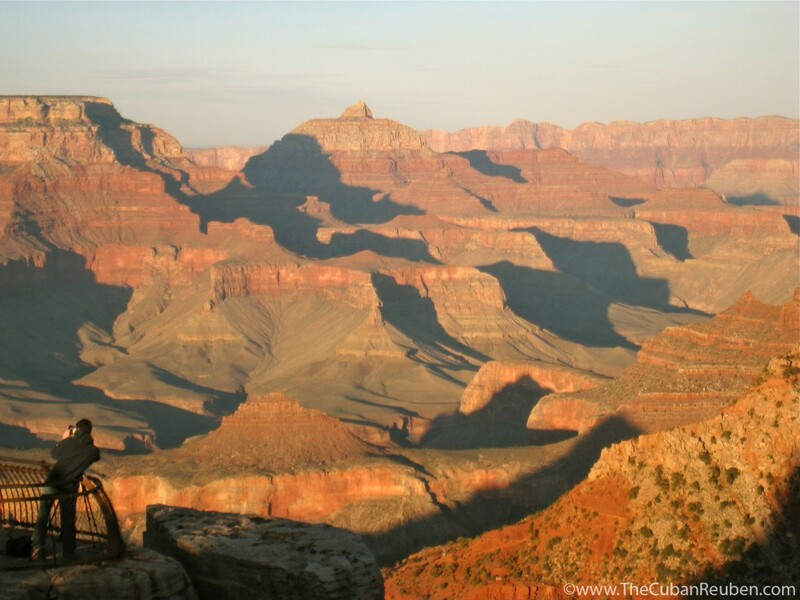 There are simply no words nor photographs that can aptly depict the awe-inspiring vista that is the Grand Canyon. The sheer depth and scope took my breathe away. Literally. To be completely honest, I never had a huge hankering to visit the Grand Canyon, but let this act as a warning to any of you stateside readers: Get ye to the Canyon! Once the sun set and the temperature dropped, we ventured into town in search for a bite to eat. We found what can best be described as Podunk Dinner Theater. Little did we know that Big E Steakhouse and Saloon was home to “singers,” “dancers,” “illusionists,” and more (no, the quotation marks are not there by accident). With our bellies full and our brains thoroughly stimulated, we decided to call it a night, and returned to the Yavapai lodge for some much earned shut eye. Hiking along the Grand Canyon National Park. The following morning, we got an early start, and hiked along the rim of the Grand Canyon. I thought the canyon was beautiful at sunset, but this hike proved to be even more spectacular. With each bend of the trail, we were greeted with better and bolder views, showcasing the different shades of rusty red, the deepest crevices and even the brilliant color of the Colorado River, whose raging rapids crashed through the canyon floor. 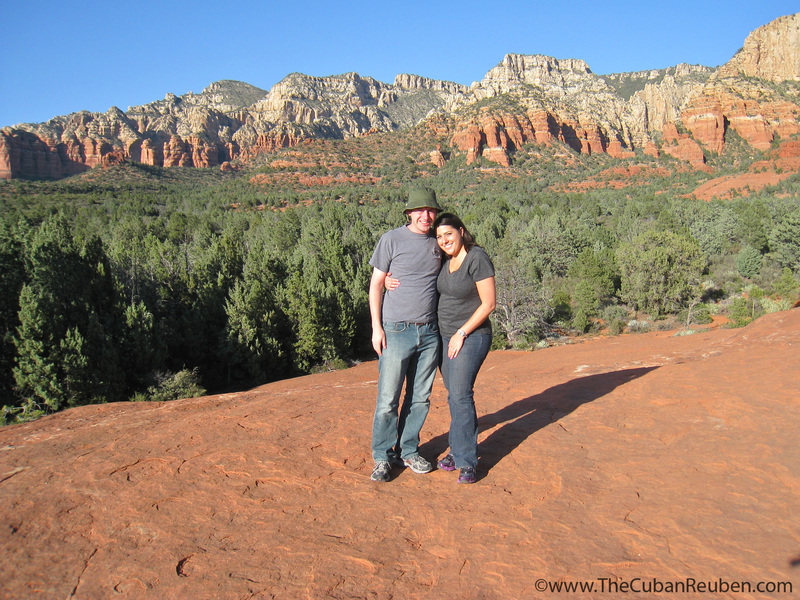 Despite the spectacular sites and refreshing breeze, the arid climate and high altitude were starting to take their toll on us, and we decided it was time to head towards our second point of interest on the itinerary, Sedona, AZ. Plus, Kenny had booked us a ride on one of the Pink Jeep tours, and we had a reservation to catch. 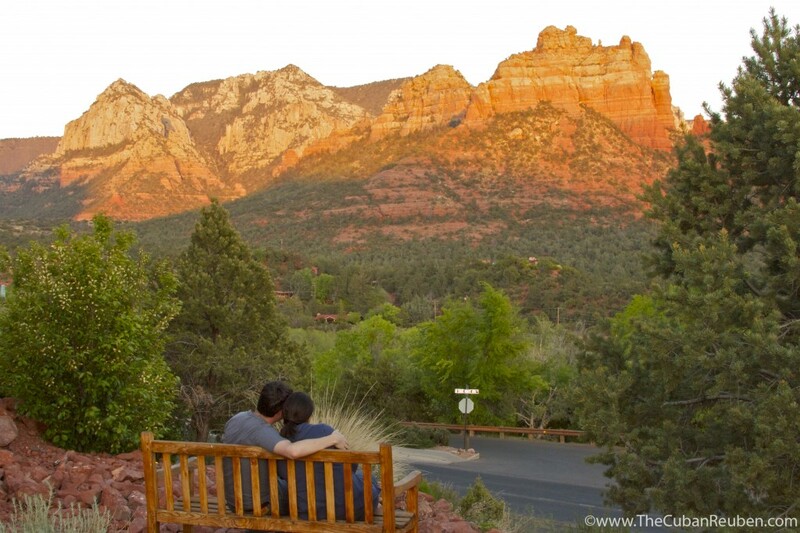 Fast forward through a beautifully lush and forested drive, and we arrive in Sedona with enough time to drop off our bags, and head in the direction of the pink jeep tours meeting place. Since we planned this trip with such haste, I didn’t do my research about the tour, and trusted Kenny, as this was something he really wanted to do. It’s probably a good thing, because had I known what I was getting myself into, I probably wouldn’t have done it (and I’m REALLY glad I did). View from the Pink Jeep tour. 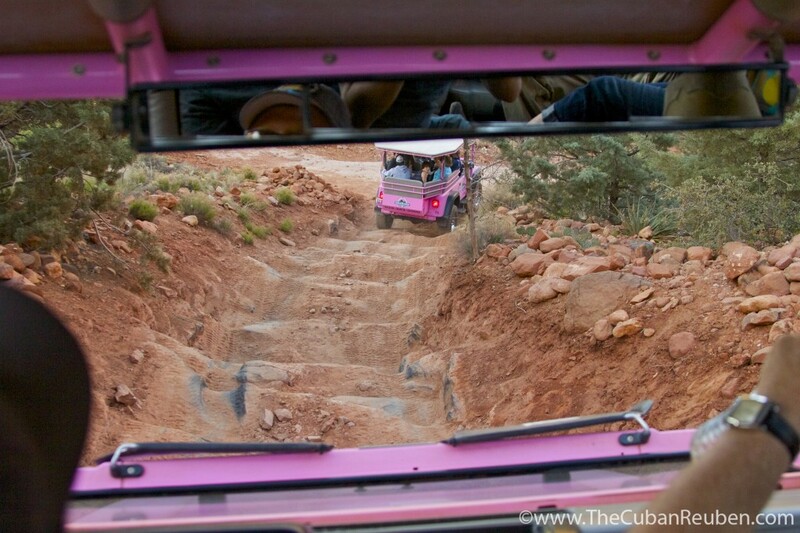 A group of 6 of us, plus the tour guide, loaded into a customized jeep painted Barbie pink, and headed for areas in the Sedona landscape that you would never reach via foot. The guide lead the jeep up rocks and down 45-degree angles, assuring us that the vehicle was built for these types of “bumpy” trails. I was definitely scared, but by taking this daredevil tour, we came up close and personal with the true beauty that Sedona has to offer (and I’m not talking about the Reiki leader at the corner store…there’s a lot of that, too). The jeep made a couple stops, and we were able to take advantage of the scenery with kodak moments. Two hours later, the tour ended as the sun was setting once again. If there’s one thing to note about my dear husband, it’s that he appreciates a good sunset. And so…we found an inviting bench, and plopped ourselves down for the panoramic view of the passing of time. Watching the sunset in Sedona, AZ. The next morning, we visited a few of Arizona’s most artistic towns, Jerome and Prescott. It was in Jerome that we found our souvenir from the trip at a local art gallery called, “Pura Vida.” Pura Vida literally translates to “pure life” in Spanish, but references the Costa Rican saying that life is good. I can’t think of a better motto for this roadtrip. Life certainly is good, and it was exceptionally so on this mini-getaway. That being said, when we returned home thoroughly dried out from the desert, I craved something refreshing and hydrating. Neither Kenny nor I were happy about heading back home after such a short trip, but I managed to whip up a little something to soften the blow back to reality. 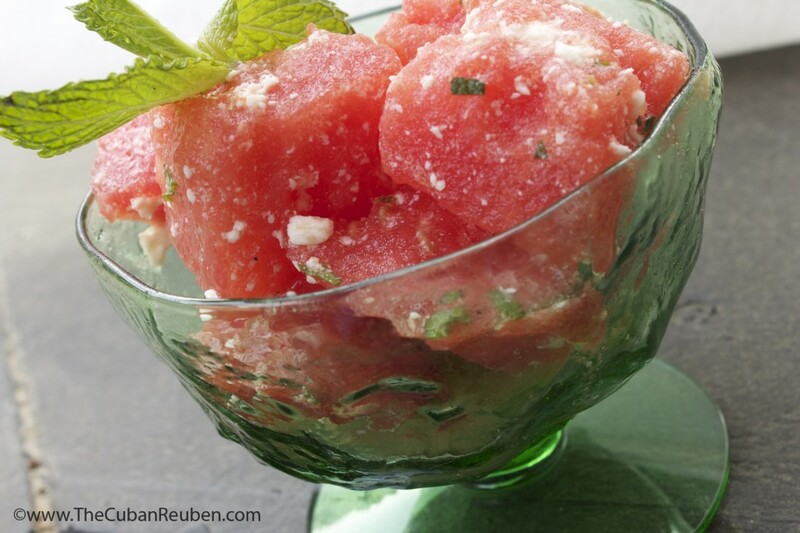 I leave you with my “welcome home” dish: chunks of juicy ruby red watermelon mixed with crumbled salty feta, coated with a dressing of mint, lime, and honey. A refreshing bite for a warm day. In a large bowl, combine the watermelon and feta. Set aside. In a container with a cover (a mason jar would be perfect for this), add the zest and juice of the limes, honey, mint leaves, and salt and pepper. Cover, then shake to combine. Pour the dressing over the watermelon and feta mixture, and toss to coat. Serve immediately, or refrigerate until serving time. This makes a lot of dressing. You may use the whole amount, or reserve some for later use. Let’s hear it for Spring! It’s Springtime, and along with warmer temperatures (hopefully), leaves on the recently bare trees, and a proper sendoff to matzoh, the bread of affliction, in my house, Spring signifies open season for all things grilled. Unless you are my gutsy mother-in-law, who braves the Ohio winter’s harshest chills for the char that can only be left by a well-seasoned grill, chances are your bbq has been on hiatus for a few months. And I know that Summer is known for all the cookouts and bbqs, but hear me out for a bit. Spring is by far my favorite season, but I only really learned to appreciate it while living in the Midwest. There’s nothing like a Midwestern winter to make you long for the renewals and rebirths that happen in Spring. I distinctly remember spending a solid three months (at least) of the year under a looming gray cloud, as I slushed my way through the snow (uphill both ways…), fighting my way through the subzero winds coming from the lake, on my way to class. I barely recognized my friends beneath their layers upon layers of winter gear, revealing only their eyes, unless, of course, I was lucky enough to hitch a ride on the Frostbite Express, which only ran on the coldest of cold days. 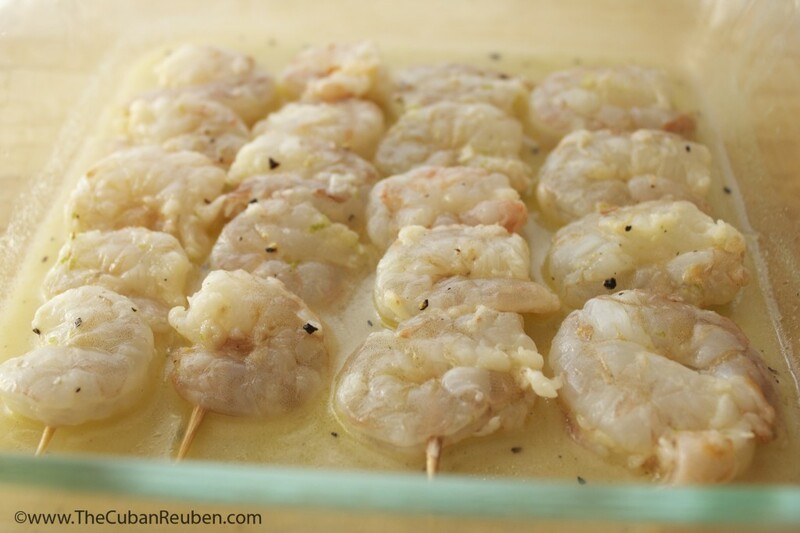 Skewered shrimp, marinating in a sweet and citrusy mix. But the truth is, coming from a place whose seasons include Hot and Hotter, it took surviving the harshest of winters for me to truly appreciate the beauty and bounty of Spring. My first year in Chicago, I joined the masses in shorts and tanks as the temperature climbed to the 60s, when ordinarily, at home, I’d be donning my scarf and gloves. Everyone loved being outside, and we all stopped to smell the roses. Literally. No, really. We stopped, smelled the perfectly-shaped petals of the flowers that were in bloom, and then went on our merry way. 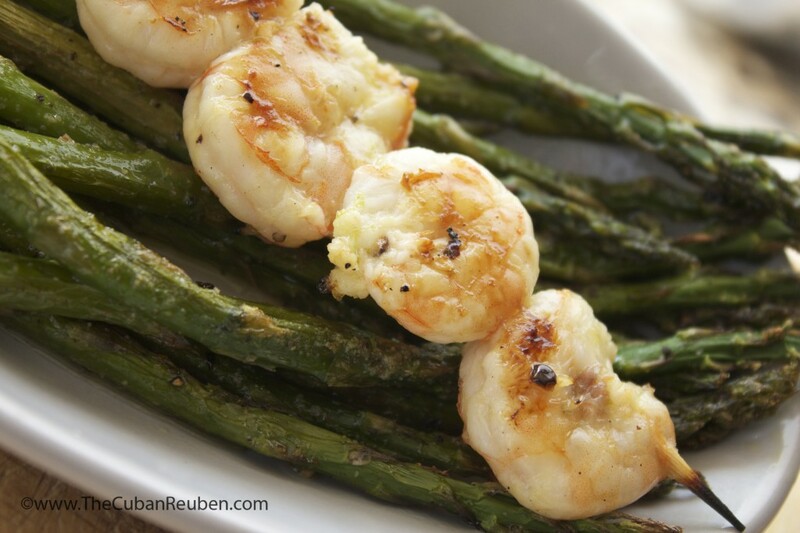 Grilled honey lime shrimp, resting on a bed of charred asparagus. Despite no longer living in a climate with a harsh winter, I still notice the little things about Spring I took for granted before. Like yielding to the family of ducks crossing the road in my neighborhood every year. Or the turtles who finally poke their heads from the pond, in the hopes of catching a sun bath. And even though I grill year-round, there’s just something about the Springtime that makes me want to be outside. Maybe it’s a bit of residue from my Midwest days, who knows? 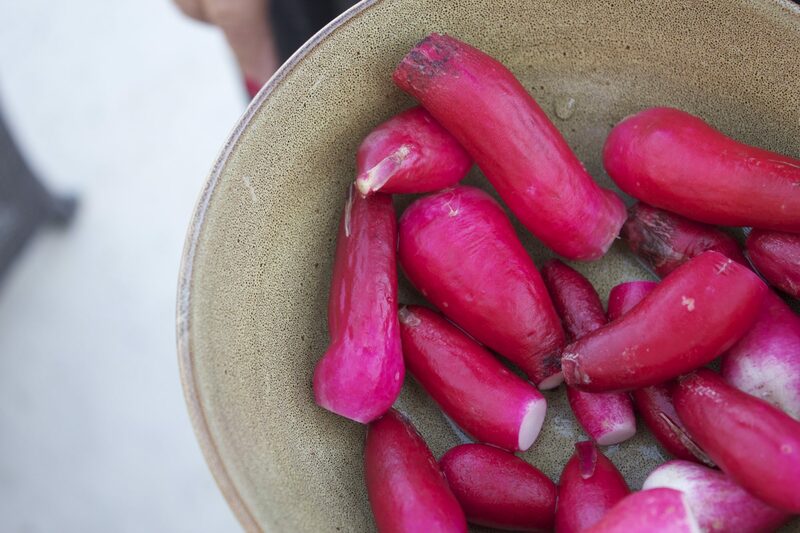 But hopefully, this recipe will make you want to get outside, too. In a small bowl, combine the lime zest and juice, garlic, honey, olive oil, salt and pepper, to make the marinade. Add the shrimp, cover with plastic wrap, and refrigerate for at least ½ hour. Once you are ready to cook, thread the shrimp onto the skewers as you heat the grill. Cut the tough ends off the asparagus, and season with salt, pepper, and olive oil. 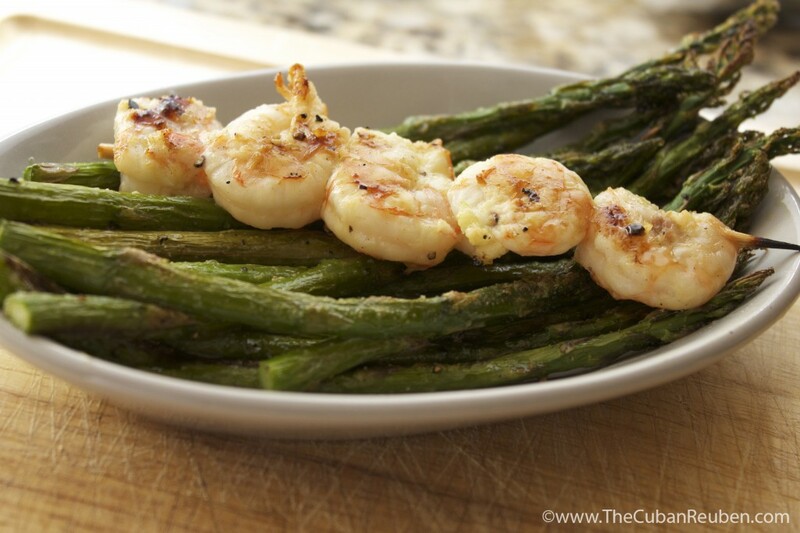 Grill asparagus over high heat for 4-5 minutes, or until grill marks appear, and stalks have slightly softened. Grill shrimp for about 2 minutes on each side, or when they have turned completely pink, and have curled. If you are keeping kosher, cubes of chicken breast make a great substitute for the shrimp.